Sydney is a great place and there are many cool things to do with kids. It doesn’t really matter whether you live here or if you are just visiting – everybody can have a great time in this beautiful city. The weather is a major bonus. There’s tons of beaches, the national parks and all the major tourist attractions that are just waiting to be explored by the little people. Below you will find a list of the very best kids activities Sydney has to offer for kids and teenagers. There’s tips for rainy days and tips for the great outdoors, ideas for the school holidays, there’s places where you can eat, and places where you can have tons of fun. It’s a long list of more than 70 things to do in Sydney with kids! Generally speaking, most attractions in the CBD come at a cost, many of them are really not cheap. I have included them anyway because I think that expensive does not necessarily mean overpriced. If you are a Sydneysider you will certainly revisit some of these places from time to time despite the high entry fees. If you are visiting as a tourist you may be short for time and grateful for the suggestions below. Either way, everything is this list is tried and tested and reflect my personal opinion. This famous wax figure museum in Darling Harbour’s Entertainment precinct may not be as big as the London counterpart but it is still one of the best kids activities in Sydney. It houses all the great figures of Australian history and pop-culture, plus you can have your picture taken by a professional and even touch the wax figures! Despite the small size the list is exhaustive. Sports stars, movie stars, politicians, historic people, even ET is included in this exhibition. Right next door you will find Wild Life World which is basically an indoor zoo that focuses on Australian native animals such as spiders, snakes, kangaroos, emus and koalas. You may not realise it when looking at it from the outside but there is actually quite a lot of things to do for kids. So despite the hefty ticket prices this zoo is well worth a visit, in particular if you cannot make it out to Taronga Zoo. My favourite two areas: the butterfly garden which gets you really close to these colourful insects, and the roof-top koala encounter where you can have your picture taken with one of these super cute animals (fees apply). Probably one of the best attractions that Sydney has to offer, and also an ideal choice if you are only here for a short visit or if it happens to be a rainy day. The aquarium can be terribly busy though, so see if you can visit during off peak hours. My favourite things to see: the shark tunnel, the Great Barrier Reef tank and the dugongs. If your little ones are not scared of heights then this might be a wonderful thing to do. Right in the centre of the city you will find the Sydney Tower in Pitt Street, a purpose built observation tower with a height of around 270m that offers stunning views of this beautiful city, on good days from Bondi to Wollongong to the Blue Mountains and way up north. It’s a really attractive view due to Sydney Harbour in the north and Botany Bay in the south. Children from 8 years of age can also attempt the Skywalk, which is an outdoor adventure that takes you all the around the tower on a balcony with see-through glass floor. General admission also includes the 4D cinema experience. The Rocks is the historical district in Sydney right next to the harbour. There are lots of fun activities for kids that you can explore here. 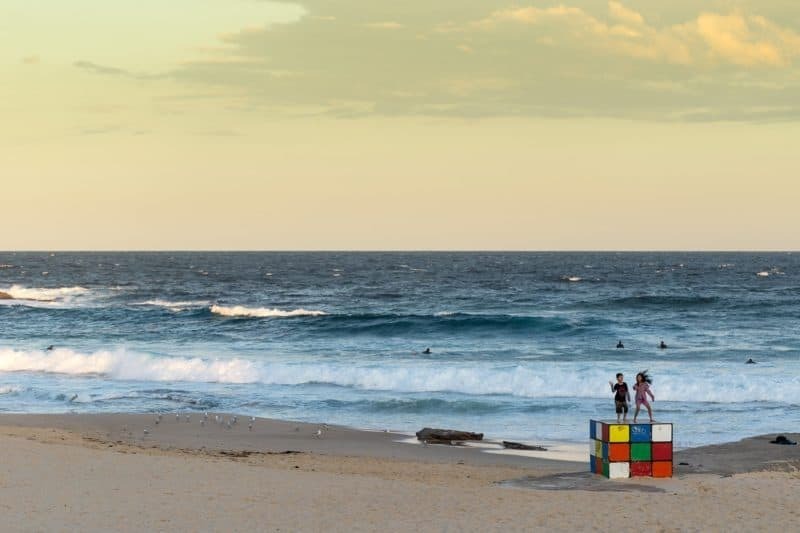 The good thing about Sydney is that family-friendly beaches can be found all over the place, no matter whether you are looking in the Northern Beaches, around the Harbour or in the Eastern Suburbs. On Sydney’s North Shore you will find a piece of paradise that is not surprisingly very popular with the wealthy population that call Mosman their home – Balmoral Beach. This long stretch of beach is not just extremely child-friendly, it also offers great views and plenty of things to explore, for example there’s a small footbridge that crosses over to a small island with great views of the harbour. For food or coffee, expect more pricier options but it’s certainly a beautiful beach where the children can run free. Views close to beautiful Shelly Beach in Manly. One of the best things to do in Sydney is exploring the beautiful areas around the harbour together. Located in the sea-side suburb of Manly, this little beach comes as a package deal – already getting there is a great experience for the senses. From Manly’s main beach follow the pathway along the steep cliffs to the little bay that is sheltered from great currents and away from the traffic. While the sand is rather coarse (hence the name), the lack of waves makes this beach ideal for snorkelers and divers. There’s public barbecues in the back, showers and WCs, and now also the Boathouse which sells snacks at the kiosk and hot food in the restaurant. Bronte Beach is located in the Eastern Suburbs, just a short bus ride from the city. Its biggest drawcard is its sheltered position surrounded by parklands, perfect for a picnic in the shade. Tthe headlands seem to give this beach a bit of a secluded feel that is missing in the bigger neighbouring beaches of Coogee and Bondi (sometimes it’s all about psychology). This is an ocean beach, so there will be waves and rips, and you need to ensure your children are save at all times. The most important rule to remember is that the kids need to stay between the flags as this is always the safest part of any Sydney beach. This harbour-side pool in Double Bay with stunning views is a great choice thanks to its generous shark net enclosure which makes it popular with young and old. In fact, on weekends it can get a little bit crowded here. There’s a kiosk for snacks and ice-creams. Since you are still quite close to the city parking can be a bit of a hassle, so consider using public transport to get here. 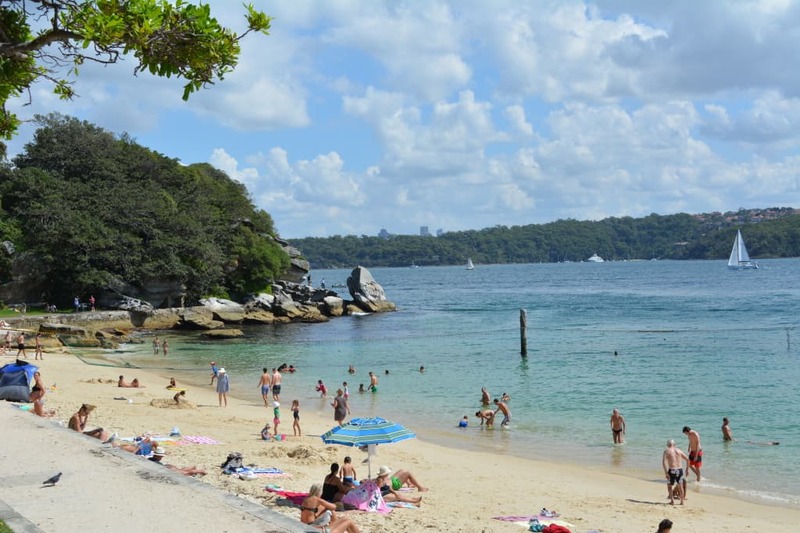 Shark Beach and Nielsen Park are among the most family-friendly beaches in Sydney. A lovely harbour beach in Vaucluse, Nielsen Park has it all. Great facilities, a restaurant and kiosk, fabulous views, picnic areas with lots of shade and glistering Shark Beach. If you are a visitor to Sydney, this beach is perfect if you want to combine the beach with some of the best views of the city. Definitely a popular thing to do in Sydney with kids. A little bit further away but with rivalling views of the city skyline, Camp Cove in Watsons Bay offers calm waters, plenty of sand, a kiosk and showers. The beach is also great for snorkelling and non-motorised water sports such as kayaking or paddle boarding. Back on the North Shore, Clifton Gardens is directly opposite on Camp Cove, a wave-free extremely toddler-friendly beach with shark net, picnic facilities and a very relaxing holiday feel. Older kids may want to jump off the pier or explore the underwater world with their snorkelling gear. There’s also a huge playground with large sun sails that they kids will love. This used to be our local beach, ironically before we had kids. Because Little Manly beach is fantastic for children of all ages. It has a shark net enclosure which the bigger kids climb on to jump off, there’s rocks to explore and views to enjoy. No big playground here but a good kiosk and this warm neighbourhood feel that make you feel so welcome. If you are located in the Eastern Suburbs then the Wylie’s Baths is one of the best kids activities Sydney offers to smaller children. Sometimes pools are a preferred option to beaches as they are free to swells, making it easier for swimming and you don’t run the risk of encountering nasty marine animals like jelly fish (they don’t kill you in the Sydney area but they can hurt like a wasp sting!) and sharks. The Baths are not free as opposed to many public rock pools along the Sydney coastline but the facilities and location is good, so the small fee is actually quite justified. What I really like about this facility is that you can always check the current conditions on their website before you pack your stuff and get down there. The baths are open every day of the year. If you are staying in the city then it’s just a short ferry ride to this beach which is located right next to Manly Wharf. Manly Cove comes with a shark net enclosure, large pine trees offering shade in summer, showers, kayak rental and takeaway outlets and a supermarket right next door in the wharf. You can combine a visit here with a day trip to Manly, or you could visit the Manly Sea Life Sanctuary which is right next to the beach. Manly Cove is also popular with the famous fairy penguins, and you may be lucky and see the colony in action when you are visiting. The walks below a suggestions that are particularly child-friendly and already absolute fun activities for kids. 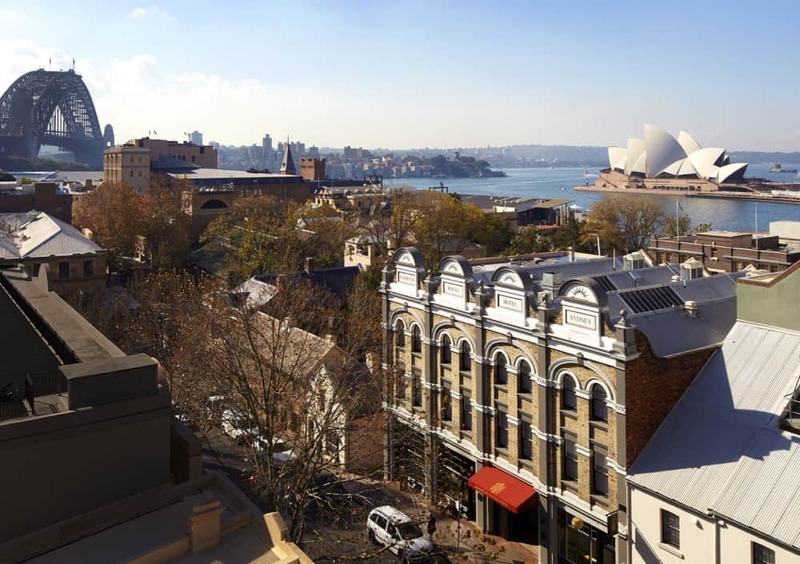 Fabulous views, interesting historic features, easy to reach – these walks give you plenty of ideas to get back out there and explore the beautiful natural spaces that we have here in Sydney. Also a great, free thing to do in the school holidays in Sydney. 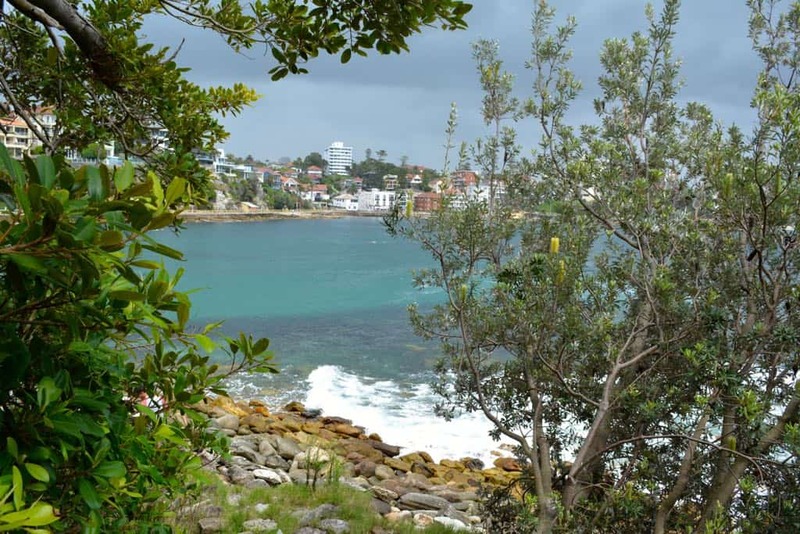 The Fairylands Trail is a loop walk on Sydney’s North Shore. It takes about 2.5 hours to master and takes you through a variety of environments including the historic site of Fairylands and across the Lane Cove river. Start is at Fullers Bridge. Despite the beautiful name you will probably not encounter fairies along the way, but the Pleasure Garden is a historic piece of cleared land that used to be a popular excursion destination some time ago. Today, there’re still a lot of interpretive signs around the area, so you explore the grounds together with your children and imagine how things used to look like in the old days. Plan around 2 hours for this easy walk along the shores of the Sydney Harbour, not far from Taronga Zoo. Start at Bradleys Head and follow the trail along the water with rewarding views of the most iconic Sydney icons such as the Harbour Bridge and the Opera House. Highlights along the way include also Bradleys Head Amphitheatre and the Military relics at Bradleys Head. West Head Lookout overlooking Palm beach and the lighthouse. A great idea for families with kids in Sydney. The West Head Lookout is one of my most favourite places to take visitors. It is located in the Ku-ring-gai Chase National Park in Sydney’s North and can be easily accessed by car (fees apply). 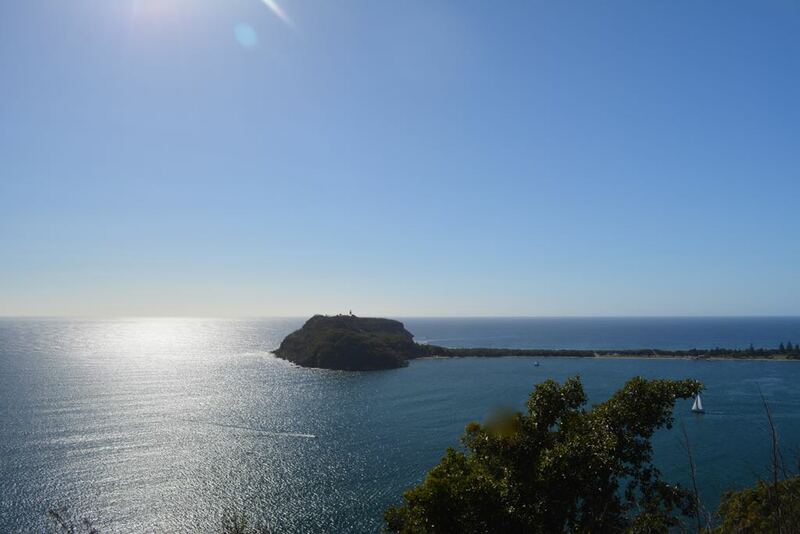 Just park at the end of the loop road and walk a couple of steps down to the lookout for some spectacular views of Broken Bay, the Pittwater, Palm Beach and Barrenjoey Lighthouse. From here it’s just a couple of steps down a path to the awe-inspiring location of the Aboriginal Red Hands cave, one of the treasures hidden deep in the bush. The loop walk takes around 2.5 hrs and will take you past further engravings and Aboriginal artefacts, however you can also just walk up to the cave and then return back to the West Head Lookout. North Head Lookout is great, even when you have a pram to push as the walk is completely sealed. You can park very close to the lookout at the end of the loop road (fees apply) and then set off. I love this walk because the kids can roam quite freely without me having to worry of them falling down somewhere (of course once you have arrived at the various look out areas along the way make sure they don’t do silly things like climbing the railings). You can enjoy some of the best views from here, deep into the harbour on one side and up the coast to the other. A great spot also during the whale migration season. Plus, there are some Military relicts that can be explored safely along the way. Named after the first white people to explore this area even before the First Fleet arrived, this is a very easy, very short walk, perfect for smaller walkers and toddlers. You can take your pram if it has biggers wheels, but I recommend you use a carrier. The walk is just about 20 minutes long and it will take you through some beautiful fern covered areas and an eucalyptus forest. There’s sand tracks and boardwalks to master, overall a great way of introducing the kids to the wonders of the Australian bush. Parking is at the Kamay Botany Bay Visitor Centre car park. Technically, this is not a bush walk suggestion but rather a walk in an English Garden which is surrounded by the Ku-ring-gai Chase National Park. Which makes it no less enchanting but probably much easier to conquer when you have small children with you. What makes it so special is not just the fairyland ambience of this secluded pocket of garden but also the fact that it is so little known that you will hardly meet any other visitors. So it’s our little secret, don’t tell anyone, ok? Wetlands are a very special kind of environment, the water providing the ideal conditions for lots of birds, very special species of plants and of course amphibies and reptiles as well. More than 80 species of birds alone have been recorded here. 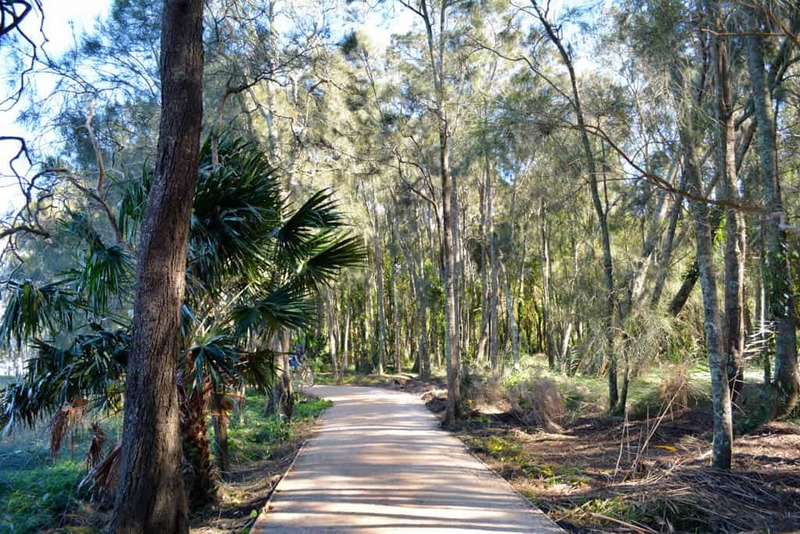 The access to the Warriewood Wetlands is easy these days thanks to a 2.4km long boardwalk which together with the surrounding streets of the neighbourhood connects to a full loop. Bikes and dogs are not allowed in this area, so it is rather safe to have your toddler go out and explore at their own pace. There’s also an enclosed playground and BBQ facilities, perfect! The walk around Narrabeen Lakes is great for families and one of the best things to do in Sydney. This walkway which goes all around the Narrabeen Lakes system is extremely popular with the Northern Beaches locals. In fact, on weekends it can get quite busy with walkers, bike riders, dog walkers and joggers all sharing the narrow path in both directions. What I like about the trail is that it is so versatile. If you complete the loop you will have come past old relicts of a concrete works, a picnic ground with BBQ facilities, a boardwalk through wetlands, tall mahogany woods, a golf course, inviting cafes and quite picturesque purple pedestrian bridges. The walk takes around 1.5hrs and is 5km long – if that’s too much you can also just tackle a section at a time. Park at the Willow Tree picnic area in the Royal National Park and embark on a short but interesting walk down to Gibraltar Rock with the kids. Gibraltar Rock is a stunningly large sandstone overhang which you can find by following the historic Lady Carrington Drive (you can see and old section of that road, made from cobblestone, right where the rock is). The place is a great spot for a picnic before you return to your car, and you can also enjoy fantastic views of the Hacking River from here. You will reach the rock after about 20mins, so this is a really good starter walk for the little ones, and since it’s fairly flat you will even manage to get a pram with big wheels up here. This 1.4km walk will take you about an hour and is great thanks to the outstanding ocean and harbour views and the military history. There’s a lighthouse to explore as well as a 1870s cobblestone road and gun emplacements. During the migration season you may be able to spot a whale or two. Park entry fees apply. Playgrounds and parks are always the best fun activities for kids. Read here which are the best places to visit in Sydney. An absolute classic right in the CBD. The kids will love this playground, it is considered one of the best kids activities Sydney will give you. But beware that it may get quite busy at times. What makes it great is the waterpark which is part of the playground, great on those hot summer days! Just make sure you pack a second second of clothes or your swimmers. There’s also giant slippery dips, a flying fox and other out-of-the-ordinary play equipment to explore, and nearby you will find a cafe and other food outlets. This playground is Sydney Park in St Peter is popular with the local community as it offers not just a cafe but also plenty of play equipment including hills slides, a suspension bridge and water play in the sandpit. This is actually one of the prettiest playgrounds you will encounter in Sydney with a very thoughtful design and great views. The kids will love that there are so many areas to explore. A fantastic playground due to the fact that it is the very first all-abilities playground in Australia. Located in Timbrell Park in Five Dock, this inner city playground offers lots of interesting play equipment including a roundabout, an all abilities ramp and slide, a climbing net, a sway bridge, tandem bull riders, a snakes and ladders path, a musical sculpture and the natural areas. There’s plenty of shady areas, lots of space for ball games, a cafe and a toilet block. A really large playground in Abbotsbury in Sydney’s west, perfect also for older kids. There’s a lot to do in terms of gross motor, including a hamster wheel, a flying fox and a big climbing frame. There’s a special area just for the toddlers. The included water park is perfect for summer, and there’s plenty of shaded space for picnics. Can a playground be described as “elegant” or “stylish”? After seeing Pirrama Playground I think it can. Located right next to the harbour in Pyrmont Point, this small but beautiful space is great for smaller kids, for as long as you keep an eye out on them while you are sipping your latte as you don’t want to have to fish them out of the water. There is not just play equipment to explore but also some grassy areas (rare in this part of town), and shaded picnic tables. In summer, jets of water will ensure the kids get wet and cooled down, and the City of Sydney has just installed a spinner that can hold up to three wheelchairs at a time. Thumbs up! This Marrickville Park is great fun in summer as it focuses entirely on the water circle, from the source in the mountains to the estuary. All the kids need to do is press a button, and water will flow for 10 minutes through all the different areas of the playground, not just fun but also very educational. Plus, there is of course all the usual stuff like swings, slippery dip and so on, as well as a bike track. The lack of a good coffee shop is a let-down, so is the unfenced the river front, but all in all this is a great park which promises a lot of fun in particular in summer. A fenced playground, perfect in particular for younger children and babies, complete with cafe and a park next door. Lots of natural shade and lovingly selected equipment including a pirate ship and a wobbly rowing boat. Parking is free along the street but you may need to be lucky to find a spot nearby. 12 metre tree house anyone? Or how about a swinging tree trunk that fits a handful of kids at a time? There’s also a flying fox and a giant suspended spider web to climb on (horizontally, that is), as well as a water park, tunnels and hill slides. As you can see, Blaxland Riverside Park is not boring at all. It is probably one of the most challenging and fun experiences in all of Sydney, although maybe a bit overwhelming for some kids at first. It is certainly something you need to check out in your lifetime, in particular if you are looking for kids activities in Western Sydney. Playgrounds can have a theme too, I think that’s totally ok. This Leichhardt playground in King George Park comes with a space theme, so you will find here an impressive rocket ship climbing structure. The Constellation Playground boasts beautiful water views, which is certainly appreciated by the parents, and there’s of course more to explore such as water play features, a climbing net tower and twin hill slides that are easily accessible via steps. This new playground right opposite the Fairfield Leisure Centre is absolutely crazy! Just look at the slides, long winding tunnels that seem to go in all directions, guaranteed to confuse you and give your kids a really good time. Just getting up to the start of the slides will be an adventure and real challenge for some kids, but, boy, is this mad construction a looker! The Attack of the Pirates adventure is a 1hr 15mins theatrical performance on board a tall ship in Sydney Harbour, complete with sword fights and cannon thunder. While expensive you can save by combining the ticket with a Luna Park ticket for unlimited rides. The show departs in Milson’s Point and in The Rocks. 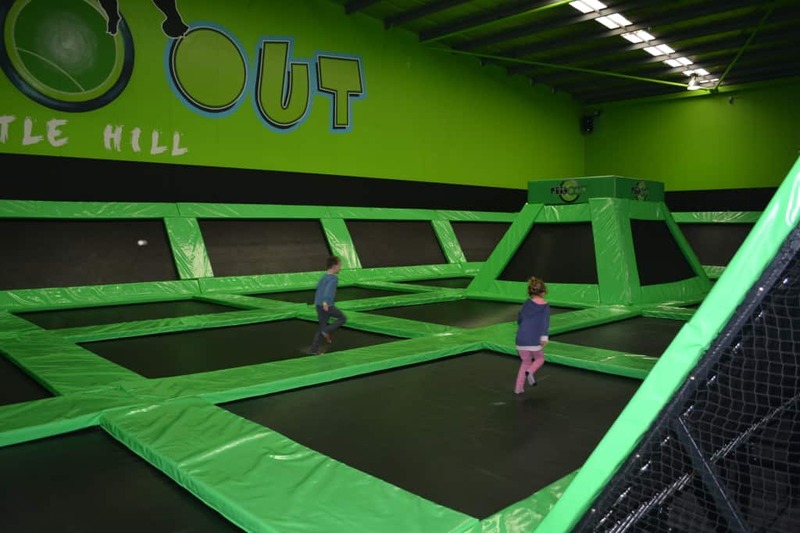 Kids Activities Sydney: Trampolines are great things to do on rainy days for active kids. One of the most favourite kids activities Sydney could offer my kids. There’s a couple of indoor trampoline arenas in Sydney that offer big halls filled with trampolines. The kids can run on these things in big strides, they can jump into pools fills with soft cushions and they can jump up the walls. Risk of injury included. These funny vehicles are like large bikes that ride on the water. Hiring one of these cost $15 for half an hour at the Audley Boatshed in the Royal National Park. Alternatively, look into hiring a pedal boat at the Lane Cove Boatshed in the Lane Cove National Park – this is suitable also for a family of four with two smaller kids. The Jenolan Cave system is located on the other side of the Blue Mountains, so getting there is a bit of a ride, but once you are there you won’t regret it! There are a couple of guided walks to choose from, but make sure you come in early to avoid a long wait. The kids will love the mix of narrow spaces, long caves and enormous stalactites, for sure. Indoor skydiving is a great fun activity for all ages, and you don’t even have to jump out of a flying plane to get all the kicks! The idea is to fly on top of an upright wind stream in a vertical wind tunnel. iFlyDownunder is located in Western Sydney. It really is a fun experience, read about our experience here! The Tree Top Adventure Park is located in the Western Sydney Parklands. For this attraction your children must be ok with heights because there are three courses to explore for children aged 3 to 9 years. There’s more courses of course for older kids and adults, and basically it’s all about leaping, swinging and flying. 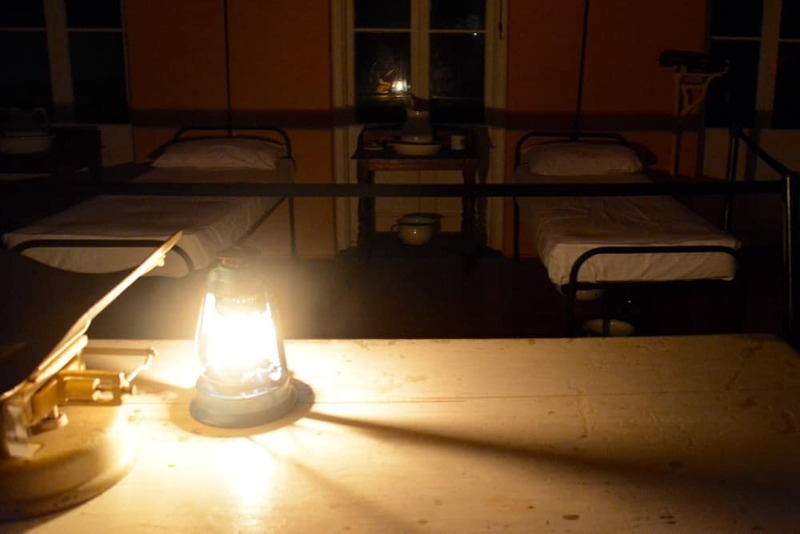 Ghost Hunting at Quarantine Station – an unforgettable experience. At Q Station in Manly you can take children from 5 years of age with you on a guided ghost tour. The Q Station is the former Quarantine Station of Sydney where ships were diverted to if there had been a sickness on board on the way to Australia. So a pretty scary place to begin with, and the ghost tour can make it all just a little bit scarier. Read about our experience here. Historic Luna Park on the other side of the harbour can be easily accessed via ferry. Entry through the big scary mouth is free but the rides comes at a cost of course. There’s different ticketing options to choose from, with the annual pass probably the most cost effective one. Sydney’s premier water theme park opens for the summer months and is everything a child could wish for: giant water slides and pools galore. And there’s more: for the very daring the Sydney SkyCoaster will raise you 75m up in the air in a harness – now, that’s scary! Plus you can surf an eternal wave at the Surf Deck. It is indeed one of the most popular things to do in Western Sydney in the school holidays. Australia is a great country for cowboy style horse riding in the bush – just take the kids to Megalong Valley Farm in the Blue Mountains or to Glenworth Valley north of Sydney. Trust me, they will love exploring the bush on the back of a gentle horse. Life Escape Room is a great family adventure game in the CBD where you get locked in a room and need to solve the clues to escape within a set time frame. The game is great for people of all ages and skill sets because you will always need someone who is good with numbers, others need to tap into their general knowledge and then you need little people to check all the cavities and hidden spaces for further clues, keys and the like. Looking for more fun activities for kids? Roar’n’Snore is a wonderful Sydney institution in Taronga zoo. Kids need to be at least five, and you will be accommodated in purpose-built powered tents in the zoo grounds. There is a walk in the evening and one at night where you see animals that are nocturnal, and then in the morning you can join the exclusive behind-the-scenes tour. An unforgettable thing to do with kids. Did you know that kids can watch a free 3D movie at the IMAX in Darling Habour if they attend the 10am or 11am session with a full-paying adult? Tickets are available at the box office. Ride the steeped railway incline in the world – in our very own Blue Mountains! Scenic World is one of the most amazing kids activities near Sydney. They also offer the steepest aerial cableway in the Southern Hemisphere. Not for the faint-hearted! Rather than going on a boring harbour cruise take the kids on a Harbour Jet ride – a speed boat tour with lots of splashing and music beats. There’s plenty of opportunity to take pictures too, so this tour really doubles as a fun cruise alternative. Kayaks are a great way to explore areas of Sydney Harbour that are otherwise too hard to access. There’s a couple of places where you can hire a kayak including Manly, Point Piper and Rose Bay. The great thing is that with a double kayak you can even take smaller kids with you, from three years of age. Wild Ropes is a fairly new attraction in Taronga Zoo, and you can do it as a standalone adventure or in combination with a visit to the zoo. The idea is that you are climbing two courses in a harness high up in the trees, completing different challenges. Kids need to be at least 10 years old to take part. In case you never heard of Segways, these are little motorised vehicles that you use while standing upright. Kids need to be at least 9 years old. Once you master the Segway a guide will take you on a scenic tour, so this is quite a different way of exploring the mountains. 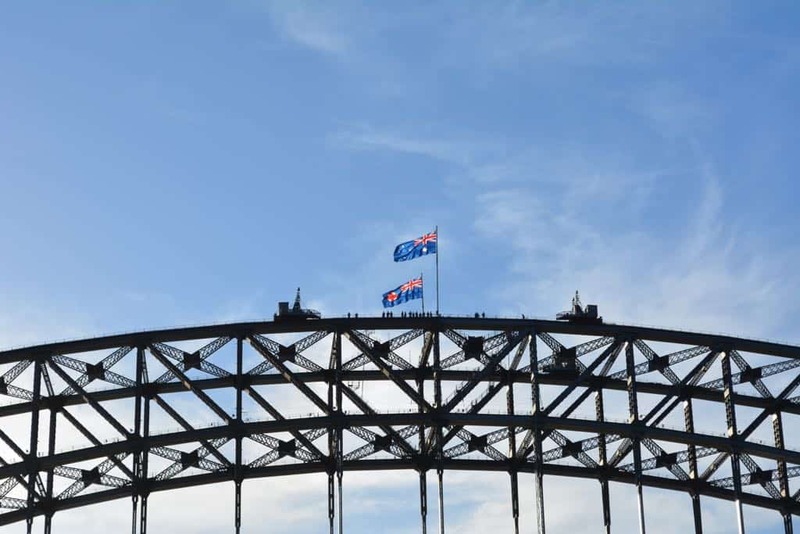 Sydney Bridge Climb – not just something that a celebrity would do! This is a very expensive kids activity in Sydney but definitely something you won’t find anywhere else in the world – join the long list of celebrities and climb to the very top of the Sydney Harbour Bridge. After a safety training and breath test you don your camouflage onesies and then climb the stops to the top of the bridge where your picture is taken. Views are outstanding during this 3.5 hrs tour. Children need to be at least 10 years old. There’s a surprisingly good choice when it comes to kid-friendly venues in Sydney – many cafes and restaurants will these days facilitate the special needs of families such as pram parking spaces, changing facilities, play areas and kids menus. The ten places I listed below are just a small sample of restaurants and cafes that do a really good job at accommodating little people. There’s a lot more out there, so if I don’t cover your area please add your experiences in the comments below. Harbour front venue with a wide deck overlooking the harbour, just steps from the ferry. The deck overlooks the tame beach, and next door there is a park with playground. The menu features a handful of kids items such as pasta bolognese and pizza, and it’s the perfect place for fish’n’chips that the whole family can enjoy. Not many places will feature kids breakfast that is also surprisingly varied and healthy, for example berry bircher musli or buckwheat pancakes. The kids lunch box reads equally healthy: cheese toastie, organic popper, popcorn or corn chips and a pack of healthy fruit chews – a place that actually put a lot of thought into the kids options too, love it! I recently discovered the Pavilion for myself – it is located just steps aways from Coogee Beach and follows a concept that offers spaces that are great for adults and kids alike. The back area has lots of different play options such as ping-pong and checkers, and the pizza here is outstanding. One of these places that all the locals will know about but that is probably quite unknown elsewhere. The Flying Fox Cafe is located next to one of the best playgrounds on the Northern Beaches in Mona Vale, in a lovely spot bordering the Pittwater. But it’s not just about location, the menu options for kids read like from a kid’s wishlist and include satay chicken, fish fingers and pancakes. This is a place where you want to sit outside and enjoy the lovely garden atmosphere and the views. This restaurant and its sister restaurant in Darling Harbour can get extremely busy at times with long queues forming outside. Why? Probably because the menu offers something for everyone. Initially started as an American inspired pancake restaurant, you can now also indulge here in pizzas, BBQ meats and salads. The pancakes, by the way, can be savoury or sweet, depending on what you are after. For kids under 10 there’s a special menu that may not be ultra healthy but has items on it like “Alice in Wonderland” and “Ned Kelly”. The Criniti’s chain is perfect for pizza and other South Italian dishes, and since the restaurant has its roots in Sicily, little people are considered very special guests. There’s a good selection of kids sized pizzas and pasta dishes as well as Nutella pizza pockets for dessert (yum!). It may not be the cheapest place around but it’s a great venue for bigger family celebrations where you want to bring together several generations with different tastes around the same table. Located in Ryde Park, the Grounds Keeper Cafe has an extensive list of items on its breakfast and lunch menu, while for kids there are chicken tenderloins, cheese burger and penne napolitana to choose from. What makes it so popular is the setting right in the middle of the park next to a great playground and basketball court. Great food, friendly staff – when it comes to pubs this is as good as it gets. Besides the usual pub fare and a good kids’ menu you will also find a bowling alley downstairs, so why not combine a lunch with a bowling match? I’m sure the whole family will enjoy it! If you are heading out to Manly, consider the Manly Wharf Hotel right on the wharf a good choice for your family. Kids meals are $10, but if you dine free Monday to Thursday from 5.30pm to 6.30pm with every adult meal, so that’s a great deal! The location is great too, right in the middle of everything and just steps away from Manly Cove beach which is shallow, netted and really family-friendly. The Henson’s mission is from farm to table, from field to fork. Sounds good? Then have a look at the kids’ menu: this is a place that totally understand that macaronis don’t necessarily need a sauce, and there’s even a salad option. Treats for the little ones include frozen banana chocolate pops and a variety of shakes. And with prices all under $10 (except the hot dog New York style) this is a very budget-friendly place too. Sydney is one of the most family-friendly cities in the world. 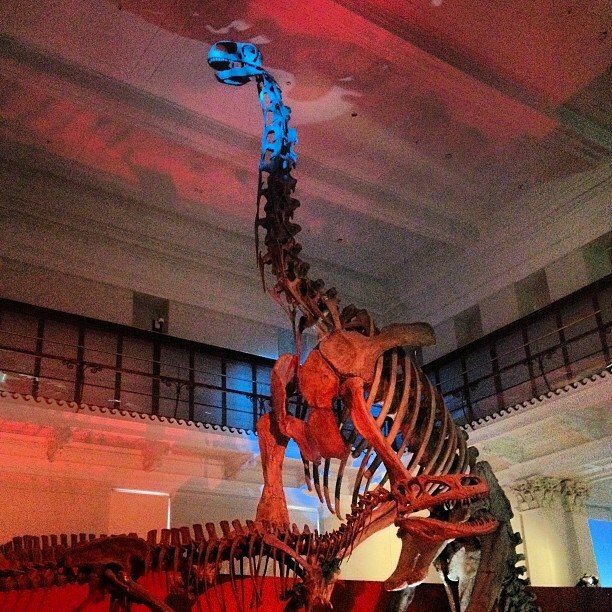 There are tons of great things to do in Sydney with kids. This list proves that you don’t necessarily have to spend a lot of money to have a good time. But as an added bonus there are plenty of paid fun activities that you can enjoy with your little ones as well. What is your favourite Sydney kids activity? Let me know in the comments! Ready to explore Sydney with Kids? Looking for some exciting ideas to try in the school holidays? Check out this recommended book for more fun activities!